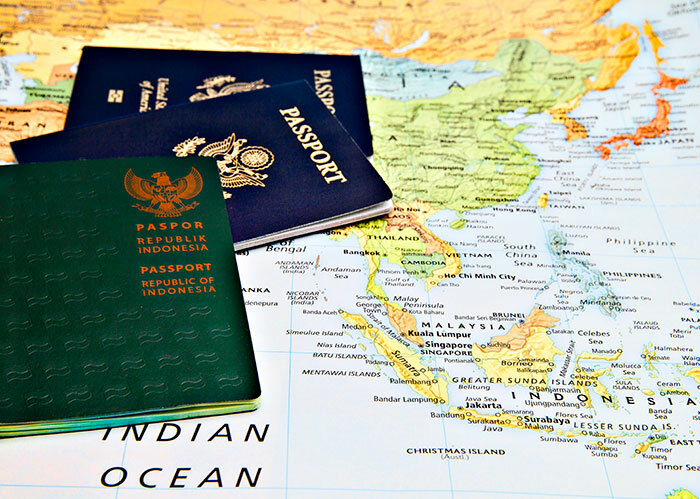 One of the biggest issues we faced when traveling to Indonesia in the past was dealing with visa issues. The last time we went back to Indonesia in 2005 my wife (who is Indonesian) sponsored my son (we only had one child at that time) and I for a 60 day social visa which worked out well because that was all the time I could get off from work. But we always wondered how we would swing it if we ever wanted to stay more permanently. Indonesia works off the principle of ius sanguinis (right of blood) principle which means that children born in Indonesia receive the nationality of their father. This is different than the US which applies the principle of ius soli (right of soil) where citizenship is given to anyone born in the country regardless of their nationality. Since our kids were born in the US they were granted US citizenship and even if they had been born in Indonesia they wouldn’t have been granted citizenship there because of ius sanguinis principle, even though my wife is an Indonesian citizen. But then in July 2006 Indonesia passed a law that granted dual citizenship to the children of mixed marriages regardless of where they were born. This was great news because now my kids could leave the US on their US passports and enter Indonesia on their Indonesian passports and stay as long as they wanted. There is one caveat however. 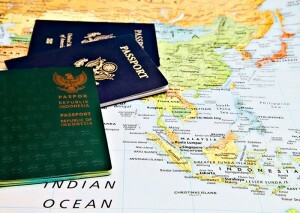 At the age of 18 they must decide whether to renounce their foreign citizenship or give up their Indonesian citizenship. So citizenship appears to be limited in duration to childhood years. Also, the new rules of dual citizenship were not applied automatically to children born before August 1st, 2006 which was the case for both our kids. We had to officially request dual citizenship in writing in Bahasa Indonesia (Indonesian language). So we began the process of applying for citizenship and Indonesian passports for our two boys. Please note that the procedure I document here is no longer valid if your child was born before August 1st, 2006 as the Indonesian citizenship act only gave 4 years for children to claim their Indonesian citizenship and expired in August of 2010. If your kids were born on or after August 1st, 2006, then they are automatically entitled to Indonesian citizenship. My primary purpose here is to show that if you are married to a foreign national you may have options for receiving dual citizenship for your kids or even yourself. Of course mileage may vary. It doesn’t matter what government you deal with there will always be forms to fill out and fees to pay. We filed the first set of forms in July of 2009 with the Indonesian Consulate General in San Francisco. These forms were the initial application which also included a copy of our kids birth certificates, photo copies of both my wife’s Indonesian and my US passport, six recent passport size photos of the kids, and a copy of our marriage certificate (we only have one and that is an official one from the Indonesian government). We also included a money order for the fee which totaled $190 as well as a prepaid return envelope. And then the waiting game began. We knew that things were generally taking several months to process from other friends who had started the process before us. There had been a flood of submitted applications and things were backed up as information needed to be sent to Indonesia where the Minister of Justice and Human Rights Affairs would grant the application and send it back to the embassy. After about 4 months my wife contacted the embassy who told us that the applications were still being processed. So we waited some more. The days turned into months and before we knew it we were into 2010. In February we attended our local Asian Celebration and met with the Consulate General of Indonesia who came up from San Francisco for the event and who is just an incredibly nice guy. The staff members we talked to showed some interest when we told them that we had applied in July 2009 and had not heard anything back. We got the number of a lady there who asked us to call her and she would look into it. So a few weeks later when my wife called her she said it was still in process in Indonesia. Finally in July we got word that the application had been approved and we needed to submit additional documents and fees. We sent in two forms: Pemberitahuan tentang Paspor (Notice of Passport) application and Permohonan Untuk Mendapatkan/Melaporkan (Petition for Report) which I believe is for the passport and the citizenship paper. We also included a required $50 fee. A few weeks later (now well into August) we called the embassy again and discovered that there were additional fees that we needed to pay. So we sent another $106 and a prepaid envelope and two weeks later in early September our boys received their Indonesian passports and documents claiming them as Indonesian citizens. They now hold dual citizenship until they turn 18 at which point they will have another 3 years to decide what they want to do. For us the entire process took 1 year and 2 months and cost a total of approximately $350 ($175 per child). I have no idea if that is a typical time frame for processing. This was just our experience. So now we have one more thing checked off our growing list of things to do before the big move. Next up is to research options for my visa; how long will it be valid for and what will the cost be? But at this point just knowing that my kids won’t have an issue entering Indonesia and staying long term is a relief. Another benefit is that they can attend Indonesian schools if we decide to go that route. I’d love to hear from others out there who hold dual citizenship and passports from multiple countries. Leave a comment below on your experience. Also, if you have questions about our experience, please contact me. I’m happy to answer any questions that I can. Matt- This is an interesting post… So after your kids turn 18 (+ 3 years), they have to decide if they want to keep their Indonesian citizenship? … I know the US generally allows dual citizenship, but not sure about Indonesia. Do they have to renounce one or the other at some point, or can they hold dual citizenship perpetually? Regardless, it was a good move on your part to secure their passports well in advance. Now, it sounds like most of your family will be “coming home” when you head to Indonesia! Ryan – that is correct. As I understand it, currently they can maintain dual citizenship with Indonesia until they reach the age of 18. At that point they have 3 years to decide whether they want to A) Keep their Indonesian citizenship and renounce their US citizenship, or B) Renounce their US citizenship and keep their Indonesian citizenship. Currently Indonesia does not allow dual citizenship with the US. Maybe that will change in the future. And you are right! Most of my family will now be “coming home” when we arrive in Indonesia. Thanks for your question Ryan. I’m excited about your adventure that is only a few months away. Hi Priyank! Yes, it was quite the ordeal but so good to have it done now. I would love to see the day when people are able to travel across borders without all the complexity and regulations. I really feel it is important for people all over the world to travel and experience other cultures. Only through personal experience and understanding will the world see peace. That’s great you could do this. I’m Canadian by birth and we just went through the process of getting citizenship for our kids. Hope to meet you and your family soon! Thanks Rebeca! It will really make a huge difference in our long term stay in Indonesia not having to worry about visas and applications.